Gaze upon Luna and you’ll see modern reflections of grace from every era, designed to bring enduring style to your wedding. Gaze upon Luna and you’ll see modern reflections of grace from every era, designed to bring enduring style to your wedding. This is the line of choice for polished brides with a little more to spend. The average gown price is $3500. Inspiration is drawn from every era of fashion and updated to create trademark silhouettes with timeless appeal. Notice elements of chic 1930s cocktail attire, statuesque Greco-Roman beauties, fresh takes on Victorian boudoir and voluminous party gowns. Our collection brings diverse influences to create captivating shapes — find the piece that inspires you. The choice of fabrics featured in this line are exquisite, such as 100% silk and head-to-toe lace. Many pieces feature ornate, handcrafted details including lace appliques, beading and embroidery. Trains on the end of the dresses are treated with the same reverence as the entire gown. 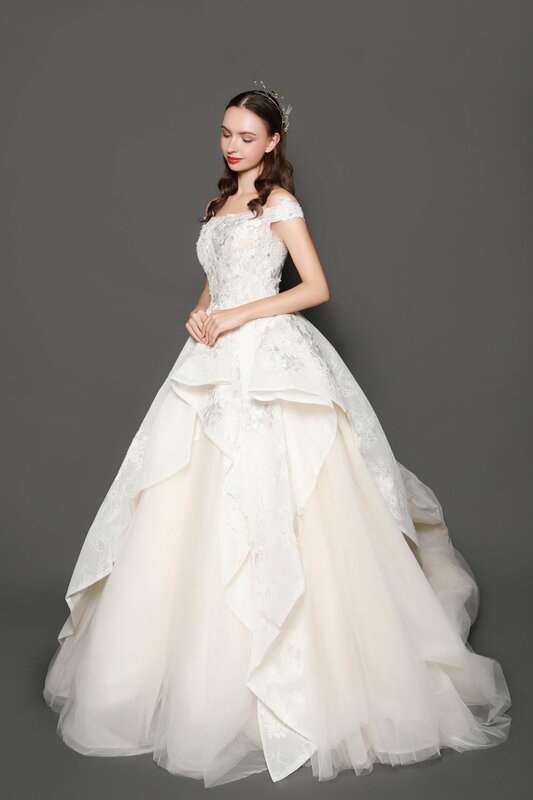 As you take your walk down the aisle, the train echoes the dress and surrounds it with its own unique aura. You are a woman of the world - a woman of today. who appreciates tasteful, thoughtful haute couture. This timeless collection will wow you. Just as you will wow them all.